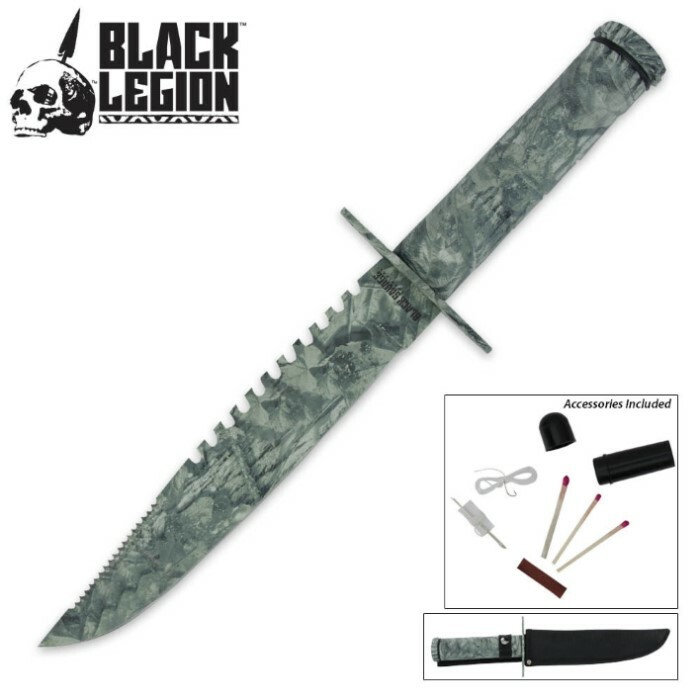 Black Legion Camo Survival Knife & Sheath | BUDK.com - Knives & Swords At The Lowest Prices! You will be prepared to take on the jungle as long as you carry this Black Legion Jungle Fighter Survival Knife with you! If you're looking for a dependable survival knife at a rock-bottom price, you found it here! Came sharp out of the box. The knife has a good balanced weight but not too heavy. Knife handle is all-metal, I use leather gloves in rainy conditions. The survival equipment enclosed is very limited but enough room to add your own. Compass works well. I wanted a cheaper, yet good quality survival knife and that's exactly what I got. For made in China a excellent piece. Way better than I imagined.. NOT too big. Looks Cool. Great sheath. Also I want to add that there is a LOT of room left in the handle with the survival kit. You know, room for fire starter, cord, and maybe some cotton balls with Vaseline on them. The camo is very cool looking and it also has a big O-ring to keep it water tight. For this price I would recommend it for every outdoorsman. Great knife for the price.Sheath is better than most.If you want an inexpensive survival knife this is a good one.